You'll notice that there are no days of the week. We plan our meals, but we like to spontaneously eat out a couple times a week. Leaving off the week day names gives us that kind of flexibility. Our eating out is also the reason there are only six meals on the sheet. Well, that, and the fact that seven would be too squished. 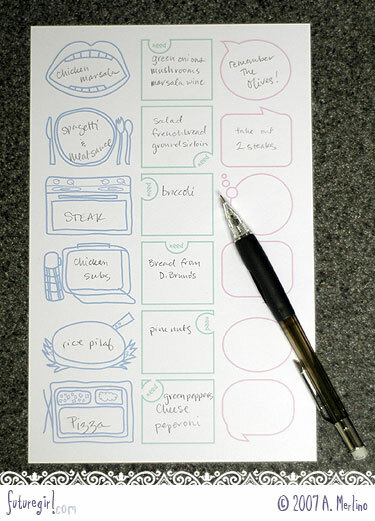 Here we list the items we need to buy for that meal. Usually it's fresh vegetables, but it can also be stuff that we've run out of. Being able to see what we need for the next several meals helps us plan our shopping so we don't end up walking to the produce store every night right before dinner. The note might be about the meal we're making, such as, "remember the corn" (which I seem to forget to make on rice pilaf night) or the note might be a reminder to take the steak out of the freezer and defrost it for the next night's meal. I had so much fun drawing all the ridiculous little illustrations. If I had to pick a favorite, it'd be the top view of the TV dinner on the TV tray. I can't remember the last time I ate one, but I always thought they were *so* awesome when I was growing up. Holy smokes, I just realized I remember when they came with FOIL over the meal, not plastic. I'm getting so old. If you'd like to use it yourself, it's available on my free downloads page. My peacock paisley intarsia chart is going to be included in Picture Perfect Knits by Laura Birek, from Chronicle Books! I love every single thing Chronicle Books puts out. It's so exciting to know my design (and name!) is going to be in one of their books! Yay! Doane Paper is my newest-favorite office supply. 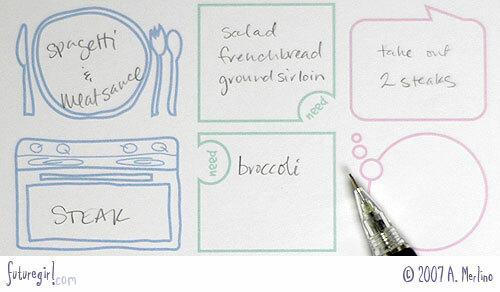 It's an awesome grid paper that's also lined. I was hooked right after I printed my own sheet using his free sample pdf. 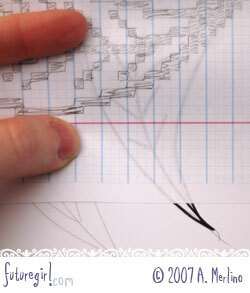 It's perfect for lists, futuregirly graphs, intarsia charts, and project diagrams. Plus, buying Doane Paper supports an indie creator. What's more awesome than that?